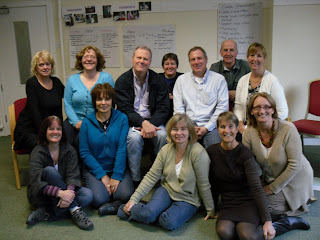 In early November I took part in an intensive VSO training weekend held at their centre in Birmingham. This was when I met up with the eleven other volunteers, including Janet and Karen who are also going to Ghana. Janet is a Headteacher of a primary school in Worthing, West Sussex. She will be working in Walewale in the Northern Region. Karen is a headteacher of a primary school in Aylesbury, Buckinghamshire and she will be going to Jirapa in the Upper West Region. The training aimed to equip us with the knowledge and skills needed to work effectively in our placements. The two facilitators, Jules and Marianne, were excellent and frequently drew upon their own experiences as volunteers which contextualised the training activities and helped to make the weekend extremely interesting and highly relevant. Areas covered by the training included VSO’s approach to development which is well summarised by its motto: Sharing Skills – Changing Lives and the place of education in development. The key issues relating to education in developing countries involve the unequal opportunities for girls and children with special needs; lack of resources, including teacher shortages; the quality of teaching; the impact of poverty on participation and the standards children achieve. Central to VSO’s work is the empowerment of local people and the development of sustainable solutions. We looked at various ways of involving everyone potentially affected by developments in the decision making process. We also explored a number of actual scenarios that volunteers had encountered and looked at the different ways we could draw upon our knowledge and skills to deal with similar situations should they happen to us. The health briefing covered all the potential hazards to our well being and there seemed to be an awful lot of them! It made us question why anyone would want to leave these benign shores! It appears that the smaller the organism, the bigger the risk to a person’s health – that is if you discount hippopotami. However, the medical advice on endemic diseases, food preparation, water purification, hygiene, and precautions to take to minimise potential risks to personal health and security was very reassuring. Nobody was put off, but all vowed to visit the GP to be fully immunised against Typhoid, Polio, Diptheria, Tetanus, Hepatitis A & B, Meningitis ACWY, Rabies, Cholera and Yellow Fever! I have also visited Boots the Chemists to stock up on Imodium, rehydration kits, insect repellants, various bite relief products and anti-fungal creams! Finally, we looked at ways of enhancing the international dimension at our schools and the awareness of development issues within our local communities.